Being a backgrounder, cattle feeder or cow-calf producer is more than a job, more than a hobby and more than a way of life. For many people it can be classified as their job or their passion, but at the end of the day, it is also an investment. And, with any investment, isn’t your goal to get the most return possible? At least your banker hopes that is your goal. That’s why it is imperative to take care of your investment, protect it with the resources available to you and watch your ROI grow. A good nutrition program is a key component to every phase of production. From breeding to calving to weaning to market time, nutrition plays the most important role in keeping cattle healthy and performing. That’s why a high-quality nutrition program is a resource you shouldn’t skimp on. “A nutrition program is going to be a majority of your production cost, 60-70%, so it doesn’t matter if you are feeding poor quality or the best of the best, why not invest in a program that will help you get the most performance out of the resources you have available to you in that nutrition program? You can only cut your nutrition costs so much without sacrificing performance, so it is absolutely an investment you need to make,” said Lindsey Grimes-Hall, BioZyme® Inc. Nutrition and Field Sales Support. An investment in a good nutrition program can pay dividends in several ways, especially when it comes time to sell your calves. A high-quality nutrition program can keep cattle healthy, which reduces the need for costly antibiotics and the labor to treat a calf. Nutrition can also promote growth and more efficient feed conversion. And, if you have calves that are treatment-free that have been on a high-quality nutrition program, your calves could qualify for a variety of value-added programs in the marketplace today that pay premiums. VitaFerm® Gain Smart® is a high-quality vitamin and mineral supplement specially designed for stockers and backgrounders. The highly fortified supplement comes with the Amaferm® advantage to ensure that the calves are receiving the absolutely best intake, digestibility and absorption all while maintaining optimum health and performance. Amaferm is a precision-based prebiotic designed to enhance digestibility by amplifying the nutrient supply within for maximum performance. Research has shown that during an 84-day growing period the Amaferm advantage has increased feed efficiency by 6-percent. Additionally, Superior Livestock has partnered with BioZyme to offer the VitaFerm Gain Smart program, one of the first-ever nutrition-based, value-added programs through Superior that recognizes calves on the Gain Smart mineral program for 45 days prior to the sale through delivery. Further, calves that stay healthy and are not treated could qualify for one of several natural programs, paying even more premiums. For maximum results, start the Gain Smart Program the day calves are weaned or on arrival if bringing in stockers. Use the Vita Charge® Cattle Drench on day one to make sure calves get to the bunk and to eat and drink readily early on. Next, introduce the Vita Charge Stress Tub to the calves the first 2-3 weeks after the calves are weaned or have arrived. The tub will promote feed and water intake, increase digestibility to maximize the energy value of the feed for more gains, and contains MOS, which helps trap bad bacteria limiting their ability to harm the animals. In addition, the Vita Charge Stress Tub provides 24-hour access to a supplement that includes Amaferm, trace minerals and vitamins that are conducive to helping the cattle recover from stress as quickly as possible. The final step in the Gain Smart Program is the introduction of one of the four mineral options available. The mineral should be introduced to the calves immediately. It works hand-in-hand with the Stress Tub, and then Stress Tub can be removed once the calves have a healthy eating routine established. The mineral options include: VitaFerm Gain Smart Stocker, VitaFerm Gain Smart Wheat, VitaFerm Gain Smart Balancer RU 1600, and VitaFerm Gain Smart Stocker HEAT®. All minerals are designed to balance basic nutrient needs for maximum efficiency. VitaFerm Gain Smart Stocker is designed for those who are feeding a medium to high forage diet and works well for both cool- and warm-season grasses. It is the most versatile and can be fed in multiple places under multiple conditions. 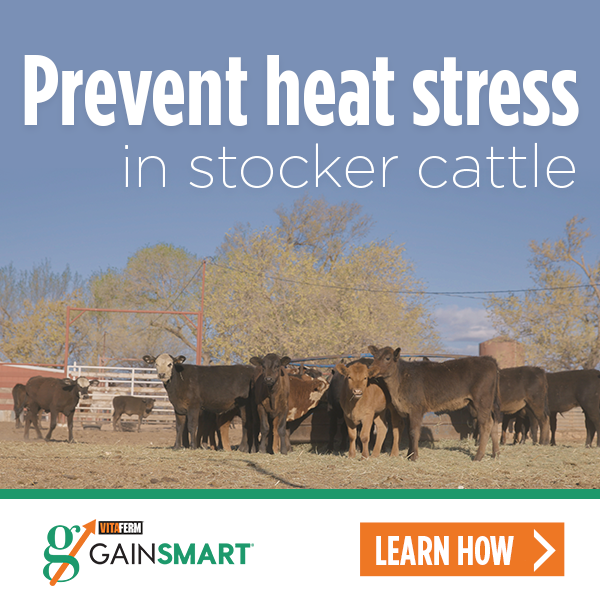 The newest option, VitaFerm Gain Smart Stocker HEAT is ideally suited for backgrounding and yearling cattle on grass and also contains plant extracts to help maintain circulation to support animal performance and gain in both heat and fescue situations. The plant extracts are research-proven to support animals’ ability to maintain normal body temperature. This mineral is ideal in the hot summer months or any time fescue is grazed. It Includes garlic, a natural insect repellent. VitaFerm Gain Smart Wheat is formulated for a higher-quality forage diet rich in protein and nitrogen such as wheat, small grains and legumes. It includes extra magnesium to help balance the nutrients in the diets and should be fed in spring and early summer. VitaFerm Gain Smart Balancer RU 1600 is designed for those calves that are being backgrounded or fed in a dry lot situation and fed a mixed grain ration. The Balancer compliments the co-products like distiller’s grain and cereal by products and works well with fermented feed like silage. Unlike the first two minerals it contains no phosphorus but does have Rumensin in it. The Balancer can be fed to heavier weights, and it is a good selection when trying to improve feed efficiency. Research proves that cattle on Amaferm gain an additional .25 pounds per day, if you feed them 100 days, that is an additional 25 pounds of gain, and at current market value of $1.42/pound for 750-800-pound calves, that is an added value of $35.50 per calf. That doesn’t consider the added health savings generated by Gain Smart of fail-out from natural or value-added programs. “With Gain Smart minerals with the Amaferm advantage, a stocker can accomplish many goals at once. They will stimulate gain since they are stimulating the calf’s rumen function. Healthy calves are more stress-free, which impacts immunity and in the end, the stocker or backgrounder should see a significant return on his or her investment,” Grimes-Hall said. Looking for an investment that pays dividends? Look no further. The VitaFerm Gain Smart mineral program will keep your calves healthy from start to finish and pay you returns on economically produced pounds by maximizing the natural energy and protein available in forage.